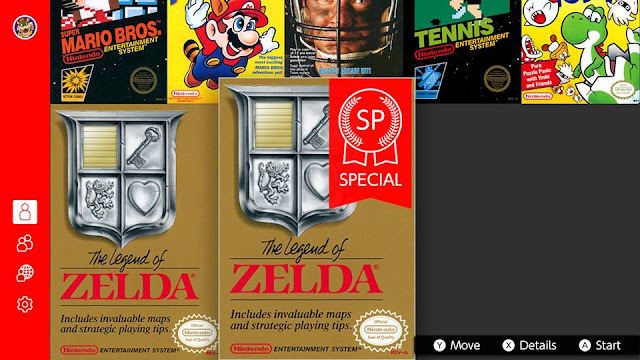 KoopaTV: Special Save File Versions of NES Games in Nintendo Switch Online! I admit that I have only played The Legend of Zelda through The Legend of Zelda: Collector's Edition compilation disc on the Nintendo GameCube. I got all the way to Ganon's final dungeon, but never could quite complete it. It doesn't sound like playing through the game with this special save file would make the end-game experience easier — it will just make the start of the game substantially more friendly. I would think that if Nintendo expects people to successfully pass through the beginning of The Legend of Zelda: Breath of the Wild, then they can pass through the beginning of the NES The Legend of Zelda. Or if they, you know, expect people to get through most of the other NES games in the collection. They don't tend to explain their controls in the game (and it doesn't look like Nintendo has any controls or mechanics explanation anywhere in the games’ out-of-game menus), but fortunately, there's only two buttons you need to work with. Some of the NES games want you to press A and B together to perform an action, though, so be careful of that. In honour of Zero being the subject of today's Super Smash Blog (actually, I was thinking about this comparison today before the blog update, so the fact that it happened to be about Zero is eerie), this save file is sort of like the Mega Man Zero Collection's Easy Scenario that took you through all four Mega Man Zero games, but with many of the power-ups already unlocked from each game's beginning. The Mega Man Zero games weren't that hard with these power-ups, but a large part of the game is collecting those power-ups as the game progresses. Therefore, a lot of the reward and feeling of game progression was removed in this Easy Scenario. On the other claw, I can't get anywhere near beating Mega Man Zero on the normal difficulty included in the collection. And for whatever reason, being bad in Mega Man Zero games in early stages actually screws you for the rest of the game by locking you out of obtaining certain power-ups/techniques that are very handy. Easy Scenario has a reason for existing, then, to counter the fiendish difficulty of what the game normally is. By comparison, The Legend of Zelda for NES isn't that punishing and brutal and doesn't really need this treatment. One wonders if Nintendo is trying to “dumb down” the hard NES games so Nintendo Switch Online subscribers feel like they're getting more value. Anyway, kudos to Nintendo for adding unannounced special stuff to the subscription relationship. Maybe they'll get it right after all. ...Then again, their “special offer” of overpriced and low-functionality special NES controllers still needs a lot of work. Ludwig tried the new NES games available today (besides The Legend of Zelda SP) and he doesn't anticipate playing any of those ever again. Anyway, can you dream up of some cool SP file ideas for the other NES games on the service? Or are you still not impressed with the unannounced value that Nintendo is generating through Nintendo Switch Online? (And if you're not impressed, can you at least admit they're trying?) Also, if you think Ice Climber isn't awful, let KoopaTV know so the staff can question your taste. I'm just hoping that SNES games will be added sometime soon. Most of the NES selection currently available is mediocre besides the couple of core games most people have played dozens of times already. Once can only play Ice Climbers so many times before not ever wanting to replay its dull and frustrating stages again. I think an SP version of Zelda II: Adventure of Link would make the game actually playable. Still don't know if it'd be fun.